This verse has long been debated over whether it was a prophetic moment for Job and he was referring to Jesus Christ when he says redeemer, who live and who will stand on the earth. Many have said, yes, it was a Messianic prophecy, and if it does, it would be an amazing testimony of early faith in Jewish history. Others have considered it more likely that Job was merely referring to his unwavering faith that he will ultimately be redeemed by God and that it was not so much a prophetic moment than it was a moment of pronounced faith. Or maybe it was a prophetic moment and he was prophesying that God will redeem him. I don’t know, and I merely just want to focus on Job‘s sudden outburst of faith – whether prophetic or not. That alone is tremendous enough for a detailed study on it. I’ll leave the debates on prophesies to the scholars. Job 19 comes in the middle of all the debates – A full cycle of debates have passed between him and his three friends, and this is in the middle of the second cycle, where Job responds to Bildad who wonders how long will Job continue to speak insensibly [Job 18:2]. How long will you torment me and crush me with words? [Job 19:2] – Job asked back, and proceeds into his typical rant from 19:3-24, expressing the grief that his three friends have caused him, complaining of his suffering and misery, his loneliness and the abandonment of his friends, wife, brothers, servants[Job 19:15] and even little boys scorn him [Job 19:18] – which in their cultural context must have been a big no-no. His friends and family have abandoned him, he claims, and likewise, God has abandoned him – though I cry for help, there is no justice [Job 19:7]. Yet in the middle of this rant, there is a second wind from Job. In the middle of crying out against his friends and against God, he abruptly remembers that his Redeemer lives, and that in the end he will stand upon the earth – deliverance will come. As abrupt as this declaration was, it was consistent with Job‘s behaviour. As much as he complained and questioned God, he understood and believed that God is his only answer. Only God can provide the answer that he seeks. Only God can provide a way out, a solution, a resolution. Only God can vindicate him. And he believed that he will gain his redemption. This entire series of debate is proof of it. While he might not understand why suffering had fallen upon him in such epic proportions, he knew that ultimately God will deliver him. Even if God isn’t answering him, even though he cannot hear God, he still believes that God lives, God is there. And because of this faith, he never turned away from God. Even as he complained, even as he questioned, even as he raged, he did it all while looking toward God. In a hopeless situation, he continued to turn back to God. Even if God didn’t look like a redeemer to him at that point of time, his faith still lies in God. Even if God isn’t redeeming him right then, he still believed redemption is coming. Why? It’s a simple answer – Job knows that other than God, there is simply no other way. There is simply no other solution, no other being of greater power and authority whom he can turn to. How beautiful is that? He was ranting against God just a few breaths ago – He has stripped me of my honor and removed the crown from my head [Job 19:9] – it was a strong accusation, as Job accuses God of removed all his honour and even the last remaining evidences of God‘s love to Job. Job claims that God has uprooted his hope like a tree [Job 19:10]. Not only was his honour stripped, not only did God remove all the evidences that told Job about God‘s love for him, Job claims that God had also taken away all of his hope.And just a few lines ago, Job pleaded to his friends to have pity on him – Why do you strike me when God has already struck out against me? What am I to do if both God and Men is against me? Job was thus hopeless now. He couldn’t turn to God, his friends, family, and even his servants have turned away from him – he was really, utterly hopeless. Yet he was perhaps mistaken in his estimation of his hope. Because Job, who deemed himself hopeless, could at this point in time still turn back to God and say, my redeemer lives! That declaration wasn’t one rooted in years of religious practice. It wasn’t normal. It was a strange moment. A second wind for Job. A sudden outburst of faith, and thus he regains his hope. Sure, he continues to rant and rage and question later on. But it was done in pretty much the same terms, he was raging in God‘s backyard. He was still there. He was still casting himself before God. I wonder about that strange, sudden outburst of faith. What compelled him to say that suddenly? It was so random. Some explain it by saying that it was the dwelling of the holy spirit in him, hence triggering the prophetic moment. Maybe. Maybe not. But I think what is clearly behind that is a heart filled with God‘s promises and assurances and a relationship with God so strong that it can withstand all these attacks. A faith so strong that Job is able to believe that he will be redeemed, even if God doesn’t seem to be interested in him right at that moment. He believed that deliverance would eventually come. His faith was rooted in his pre-suffering understanding of God‘s nature. 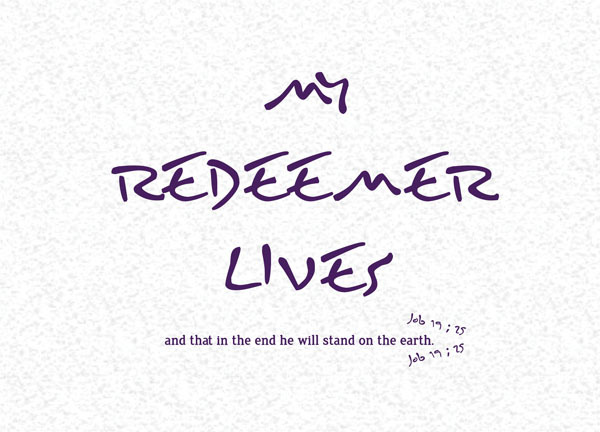 Instinctively perhaps, at a point when he felt hopeless and lonely, he cried out, my redeemer lives. Whether there was any reference to Jesus or not, today when we say ‘my redeemer lives’, we are certainly referring to Christ, who lives because he has conquered death. I wonder if we have our own, little, strange outburst of faith. Just when things seem too bleak, BAM – our instinct takes over, and we remind ourselves, no, God lives. Christ lives. God will redeem us. How powerful is God‘s love for Job, that even the remnants of it would be able to produce such a sudden outburst of faith from a Job who thought he was hopeless. We may waver in our faith at times. We may stumble and we may doubt. But God‘s grace is boundless. Even in our hopeless situations, we can gain strength from his promises. We can have our own little outbursts of faith. Finally brothers, whatever is true, whatever is honorable, whatever is just, whatever is pure, whatever is lovely, whatever is commendable–if there is any moral excellence and if there is any praise–dwell on these things.